This name uses Philippine naming customs for married women. The birth maternal family name is Trinidad, the birth paternal family name is Romuáldez, and the marital name is Marcos. Imelda Marcos (née Romuáldez, born 2 July 1929) is the widow of the Filipino dictator Ferdinand Marcos, the 10th president of the Philippines. She served as First Lady from 1965 to 1986 during the presidency of her husband. She remains one of the richest politicians in the Philippines through her collection of clothing, artwork, and jewelry, along with money in offshore bank accounts under the pseudonym "Jane Ryan". As a result, she has been called a kleptocrat by her critics who accuse her of plunder. Marcos was born in Manila but moved to Tacloban prior to World War II after the death of her mother. She returned to Manila in 1950 to pursue a career as a singer and as a beauty queen. In 1954, she married Ferdinand Marcos, who became president of the Philippines in 1965, and in 1972 declared martial law. As first lady, she built developments in and around the metropolis of Manila while spending much of her time abroad on state visits and shopping sprees. The assassination of opposition leader Benigno Aquino Jr. in 1983 caused mass protests that eventually led to the People Power Revolution. The Marcos family were forced into exile, and Aquino's widow Corazon was installed as president. After the death of her husband Ferdinand, she returned to the Philippines and was later elected four times to the House of Representatives as a congresswoman for Leyte in 1995 and for Ilocos Norte in 2010, 2013 and 2016. Marcos is infamous for her extravagance. This included owning more than a thousand pairs of shoes, some of which are now housed in a museum in Marikina. She worked as a fashion designer and model. She has sometimes been referred to as the "Steel Butterfly", by her supporters. Imelda Remedios Visitacion Romualdez was born in the city of San Miguel, Manila, on July 2, 1929. Her parents were Vicente Orestes Romualdez, a lawyer, and his second wife, Remedios Romualdez. Vicente’s first wife, Juanita, died allegedly of leukemia on August 3, 1926. Imelda is the sixth of Vicente’s eleven children, and the first of Remedios. Born into the Romualdez clan, a prestigious political dynasty hailing from the province of Leyte, Imelda grew up to a wealthy family of catolico cerrados (strict, no-nonsense Roman Catholics). She was immediately baptized after the day of her birth by Monsignor Juan Somera in the parish church of San Miguel, Manila. Her grandmother, Donya Trinidad Lopez de Romualdez, was the matriarch of the Romualdez clan. She and her husband, Daniel Romualdez Arcilla, were considered the first ever Romualdezes to have lived in Tolosa, Leyte, originally for the purpose of Daniel’s health, but soon became the mark for the flourish of the Romualdez clan in said municipality. Some other notable members of Imelda’s family are her uncle Norberto Romualdez, who was Philippine Supreme Court Justice Associate and the first of the Romualdezes to achieve national prominence, and her younger brother Benjamin “Kokoy” Romualdez, who served as the Governor of Leyte and also the Philippine Ambassador during the Marcos administration. At the time of her birth, the Romualdezes had the comforts of material prosperity and had the reputation of wealthy Manilans. However, around 1931-1932, the financial conditions of Imelda’s family began to decline. Imelda’s parents were separated for a time and Imelda’s mother left their home due to domestic differences between Imelda’s mother, Remedios, and her father’s first children. During this separation, Remedios worked for the nuns at the Asilo de San Vicente de Paul. Vicente and Remedios reconciled thereafter. To avoid further conflict, Remedios and her children moved to their house's garage. At 1937 after Conchita’s birth, Remedios’ health began to fail. On April 7, 1938, she passed away due to double pneumonia. In her ten years of marriage, Imelda had five siblings - Benjamin, Alita, Alfredo, Armando and Conchita. On the same year, 1938, Imelda’s father gave up Manila due to his declining fortunes in his law practice and returned to Tacloban where he could support his family with a simpler lifestyle. Imelda has been claimed to have met General Douglas MacArthur when he landed in Palo, Leyte during the Philippines Campaign in 1944. She speaks Tagalog and English, the two official languages of The Philippines, as well as Waray, the regional language of Leyte. Imelda studied grade one in Holy Ghost College where her stepsisters studied. In the school year 1936-1937, registration records in Holy Ghost College showed that Imelda didn't enroll again. This disappearance was easily accounted for by two sets of pictures of Imelda which were taken after she received First Communion at the Holy Infant Academy in Tacloban, Leyte. She continued her early studies in Holy Infant Academy, a convent school run by Benedictine Sisters. The old wooden structure of the school still stands today four blocks away from the Romualdez house. At school too, Imelda had to face the fact for their humiliating poverty. She was frequently among the students who had to apologize for late payments. In 1942, the Romualdezes returned to Tacloban,and around that time, Imelda's father refused to let her go back to school. When the Americans came, she lined up with a hundred other young girls in wooden clogs at the Leyte High School, eager to resume her studies. The year was 1944. She finished first year at the provincial high school where she was also chosen Miss I-A; then in her second year. she moved to Holy Infant and stayed there until she graduated. Imelda continued her higher studies in Holy Infant Academy. Imelda studied with the Sisters from 1938 to 1948, the year she graduated from high school. As a student, her scholastic record shows that she had a general average of 80% throughout her primary and high school. High school ended in the summer of 1948 when her class posed for the last time in the blue-and-white uniform of Holy Infant. Imelda learned her first political lesson when she ran for president of the student council at St. Paul's College, now the flourishing Divine Word University. That was 1951, only three years before her marriage to Marcos. At that time, she was about to graduate with a Bachelor of Science in Education. She was put up as candidate for the Department of Education, which had an enrollment of 800 students. Even during the nomination, her victory was already a foregone conclusion, but the school authorities insisted that another candidate be put up to make the elections a democratic procedure. That was how the College of Law, with 200 students, put up Francisco Pedrosa. While an undergraduate, she did some practice teaching at the Chinese high school in town shortly before graduating in 1952. She had won a scholarship to study music at the Philippine Women's University under Maestra Adoracion Reyes, a close friend of Imelda's cousin, Loreto Romualdez Ramos. She had a job at a music store but left this for a better one at the Central Bank. Straight from the Central Bank, she hurried to the University everyday. After a few lessons, Adoracion was convinced Imelda had talent and persuaded her to enroll at the College of Music and Fine Arts at PWU, under a special arrangement that would put her on register while Adoracion would continue to give her free lessons. She came back to Manila in 1952 during the regime of President Quirino and stayed in the house of her relative, called Danieling Romualdez who was a formidable politician and the Speaker Protempore of the Lower House of Congress. Danieling Romualdez did not have children on his own but had adopted three orphans. According to the book ‘The Untold Story of Imelda Marcos’ by Carmen Navarro-Pedrosa, her status in the house of Danieling Romualdez was “higher than servants and lower than family members as a poor relative”. During her father’s visit to Manila, she worked as a salesgirl in a store called P. E. Domingo where Vicente Romualdez was infuriated at Eduardo Romualdez (the Chairman of Rehabilitation Finance Corporation) and Danieling Romualdez because Vicente thought that his two nephews were “selling his daughter”. To calm the indignation of Vicente Romualdez, Eduardo and Danieling exercised their political and economic influence to find work for Imelda in the Central Bank where she worked in the Intelligence Division under Braulio Hipuna, the Chief Clerk of the Intelligence Division. She later had vocal lessons in Philippine Women’s University and met Adoracion Reyes who was introduced to her by her cousin, Loreto, and played an important role for Imelda to take vocal sessions in the university by providing a chance to get scholarship and was a teacher in the College of Music and Fine Arts of Philippine Women’s University. According to Susie Abadilla who took the same vocal sessions together with Imelda, she was not so friendly, and the reason presumably stemmed from the strict and busy routines back then, and her reluctance to talk about her family and her past. Due to the suggestion of having a performance, which became the first and last performance in a music hall from her cousin, Loreto, in Holy Ghost College, she performed three songs, “Calm is the Night”, “Sin Tu Amor”, and “False Prophet”. Her aspiration for fame commenced after she met Angel Anden and was asked to be a cover girl of the Valentine issue of the magazine (printed on Feb 15, 1953) called This Week (now, Chronical Magazine), where Anden was the editor. Imelda was not able to get an approval and acquire a sponsorship to participate in the Miss Manila contest from her cousins (Danieling, Eduardo, and Loreto), but, with the help of Adoracion, gained a sponsorship from Philippine Women’s University after a meeting with the president of the university, Mrs. Francisca Benitez. The controversial Miss Manila beauty pageant dawned on Mar 1, 1953, when Imelda and the Reyes spouses were in great despair after hearing news that Norma Jimenez became the candidate of Miss Philippines and the winner of Miss Manila, and sought to meet the mayor of Manila, Aresenio Lacson who revoked the decision and made Imelda Romualdez to be the winner of Miss Manila. The mayor announced that there were violations of rules by the International Fair Board, and it is the mayor’s authority to nominate the candidate of the City of Manila for the beauty contest. It turned out that Imelda won 655 points whereas Norma Jimenez acquired 453 points. Both Imelda and Norma participated in Miss Philippines; however, the winner of Miss Philippines was Cristina Galang (Caedo, now) from Tarlac, and became one of the members of Imelda’s band of women campaigners, Blue Ladies. Imelda and Ferdinand Marcos officially met on April 6, 1954  at the Philippine Congress, during a budget hearing of then President Ramon Magsaysay. Ferdinand was part of the opposition team who led the argument against the budget, while Imelda was there accompanied by her cousin, Paz “Pacing” Romualdez to visit her cousin Danieling, who was the Speaker of the House. It was during recess when Imelda catches Ferdinand’s eye, and the latter demanded his journalist friend, Jose Guevara of The Manila Times, to introduce him to the girl. At that time, Ferdinand already knew of Imelda and her reputation not only as a member of the prominent Romualdez clan, but also as a part of the Miss Manila Controversy of 1953. Imelda, on the other hand, knew very little of the 36-year-old Congressman, despite his prestige. After comparing heights and confirming that he was at least an inch taller than the 25-year-old young woman, Ferdinand immediately decided to pursue her in marriage. This began what was later known as the “Eleven-Day Whirlwind”, where Ferdinand, with the help of Guevarra, courted Imelda for eleven days. Throughout the Holy Week of that year, Ferdinand visited Imelda’s house once, and when Imelda claimed that she plans to spend the holidays in Baguio, Ferdinand and Guevarra did not hesitate and offered her a ride up to Danieling’s family mansion where she planned to stay, while the two booked a room in nearby Pines. For the remaining days of that Holy Week, Ferdinand showered Imelda with flowers and gifts and would visit her daily, prodding her to sign the marriage license that would close off the agreement. And on April 16, 1954, Good Friday, after having been asked by Guevarra, allegedly jokingly, if she wanted to be “the First Lady of the Land someday” Imelda finally agreed to sign it. Immediately after that, on April 17, 1954, they were secretly married by a reluctant Francisco Chanco, a judge befriended by Ferdinand, who lived in the area. However, only after receiving the blessing of Vicente Orestes, Imelda’s father, which Ferdinand asked for through telegram on Easter Sunday, did Imelda and Ferdinand officially have a Catholic wedding, on May 1, 1954, at the San Miguel Pro-Cathedral in Manila. Imelda knew that her husband Ferdinand Marcos dreamed to become the president of the Philippines ever since he was a congressman. One reason why Marcos married Imelda, aside from her physical charms, was because she was a Romualdez—an aristocrat. Imelda’s beauty, as well as her background, was appreciated to a great extent by Marcos and Marcos believed she would not only add light to his daily life but also to his political career. Imelda, coming from a family who practiced a simple lifestyle, had initial difficulties adjusting to her husband’s extravagant lifestyle. She once complained that she was only earning a hundred and twenty pesos a month despite her hard labor. To this, Marcos laughed and said that it was her fault that she was working hard only for such an amount. This was a turning point for Imelda to no longer feel guilty about spending money. From then on, she pushed herself to extreme luxury. Imelda was expected to be sophisticated, elegant, and well versed by her husband. Marcos knew that having a supportive wife, a trophy that he can be proud of, would gain him more supporters as well as votes. Imelda began dressing herself with expensive clothes and made every efforts to become the person whom her husband wanted her to be. In her efforts to being the apt wife, she was often given an eye for trying too hard, but at the same time, she also became a subject of envy to the fellow politicians’ wives. Imelda learned how to get people’s attention and to spotlight it both to her and her husband. She reached out to every single person who was seen as essential in Marcos' campaign. Her efforts were not original, but extraordinary. No other politicians’ wives shook hands with all the delegates, visited their homes, genuinely understood the concerns they had, aside from Imelda. She bombarded them with gifts when necessary. Not only was Imelda good with people but was also a skilled mediator who bridged up broken relations that occurred with Marcos. During Marcos’ presidency in the Nacionalista Party, Fernando Lopez, back then Marcos’ vice-presidential running mate, was unwilling to continue his political career. As Marcos asked help from Imelda to help him mend ties with Lopez, Imelda did not hesitate to burst up into tears so to get Lopez convinced that he should run as the Nacionalista vice-presidential candidate. By the time Marcos was campaigning to become President, Imelda’s influence in Marcos’ political career was crucial. Her husband may have been a good tactician but it was Imelda's determination and popularity that ensured votes to him. Marcos heavily relied on Imelda, and as time passed, Imelda was no longer a clone of Marcos. Instead, she had become his political partner. Marcos served as First Lady after her husband Ferdinand was elected on 9 November 1965 as the 10th President of the Philippines. Her role in the presidency was controversial partly because she was involved in altercations with celebrities. One such was with The Beatles when the band allegedly snubbed her invitation for a state dinner at the presidential palace. Another such was with Dovie Beams because of the actress' alleged relations with Ferdinand. On 23 September 1972, Ferdinand declared martial law and rewrote the constitution of the country, Imelda gained political power. As First Lady, she became "influential." She stirred controversy after an assassination attempt against her occurred on 7 December 1972, when an assailant tried to stab her with a bolo knife but was shot by the police.The motive appeared to have been her role in her husband's presidency but human rights dissidents believed it was staged by the government. In 1978, she was appointed a member of the Interim Batasang Pambansa (National Congress) representing Region IV-A. She was also appointed as Ambassador Plenipotentiary and Extraordinary, allowing her to tour the United States, the Soviet Union, Yugoslavia, and Cuba. Throughout her travels, she became friends with Richard Nixon, Muammar Gaddafi, Saddam Hussein, Fidel Castro, and Joseph Tito. She traveled to Iraq to secure oil and to Libya for a peace treaty with the Moro National Liberation Front. 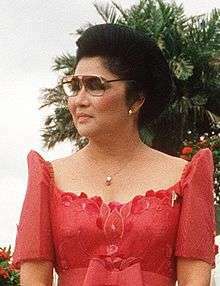 Imelda Marcos held the position of Minister of Human Settlements, allowing her to construct the Cultural Center of the Philippines, the Philippine Heart Center, the Lung Center of the Philippines, the Philippine International Convention Center, the Coconut Palace, the Manila Film Center, and the Calauit Safari Park. She purchased property in Manhattan in the 1980s, including the US$51 million Crown Building, the Woolworth Building in 40 Wall Street, and the US$60 million Herald Centre. She declined to buy the Empire State Building because she felt it was "too ostentatious." Imelda Marcos was instrumental in the 1980 exile of opposition leader Benigno Aquino, Jr., who had suffered a heart attack during his imprisonment. Martial law in the Philippines was later lifted in 1981 but Ferdinand Marcos continued to be president. While her husband began to suffer from lupus erythematosus, she effectively ruled in his place. Aquino returned in 1983 but was assassinated at the Manila International Airport upon his arrival. With accusations against her beginning to rise, Ferdinand created the Agrava Commission, a fact-finding committee, to investigate her, ultimately finding her not guilty. On 7 February 1986, snap elections were held between Ferdinand Marcos and Corazon Aquino, the widow of Benigno Aquino Jr. Despite her husband claiming to have won the elections, allegations of vote rigging led to mass protests that would be later known as the People Power Revolution. On 25 February, the Marcos family fled to Hawaii. After she left Malacañang Palace, she was found to have left behind 15 mink coats, 508 gowns, 1,000 handbags, and many pairs of shoes. Some news reports estimated that there were up to 7,500 pairs, but Time magazine reported that the final tally was only 1,060. The location where her shoes and jewelry were destroyed and the contents stolen. Marcos was allowed to return to the Philippines by Corazon Aquino on 4 November 1991. The following year, she ran for president in the presidential elections on 11 May 1992, finishing 5th out of 7 candidates. On 8 May 1995, she was elected as a congresswoman of Leyte, representing the first district, despite facing a disqualification lawsuit in which the Supreme Court ruled in her favor. She sought the presidency again on 11 May 1998, but later withdrew to support the eventual winner Joseph Estrada and she finished 9th among 11 candidates. In November 2006, she started her own business, a fashion label that included designing jewelry. In March 2008, she was acquitted of charges of having illegally taken money from the country by the Manila Regional Trial Court due to reasonable doubt. Marcos ran for the second district of Ilocos Norte in the elections on 10 May 2010 to replace her son, Ferdinand Jr., who ran for Senate under the Nacionalista Party. During her term, she held the position of Millennium Development Goals chairwoman in the Lower House. In 2011, the Sandiganbayan's Fifth Division ordered her to return US$280,000 in government funds taken by her and her husband from the National Food Authority. She won re-election on 14 May 2013 in a bid to renew her term. On 9 May 2016, she was re-elected again for her third and final term. Marcos allegedly owned assets worth US$10 billion. On one occasion, she spent $2,000 on chewing gum at the San Francisco International Airport and, on another, she forced a plane to do a U-turn mid-air just because she forgot to buy cheese in Rome. Her collection of shoes now lies partly in the National Museum of the Philippines and partly in a shoe museum in Marikina. Typhoon Haiyan (Yolanda) damaged her ancestral home in Tacloban, which also serves as a museum, although she still retains homes in Ilocos Norte and Makati, where she resides. She allegedly owns Swiss bank accounts under the pseudonym "Jane Ryan". Her claimed fortune came from Yamashita's gold, a semi-mythical treasure trove that is widely believed in the Philippines to be part of the Japanese loot in World War II. Her property used to include jewels and a 175-piece art collection, which included works by Michelangelo, Botticelli, Canaletto, Raphael, as well as Monet's L'Église et La Seine à Vétheuil (1881), Alfred Sisley's Langland Bay (1887), and Albert Marquet's Le Cyprès de Djenan Sidi Said (1946). In 17 October 2013, the attempted sale of two Claude Monet paintings, L'Eglise de Vetheuil and Le Bassin Aux Nymphéas, became the subject of a legal case in New York against Vilma Bautista, a one-time aide to Imelda Marcos. Bautista was sentenced in 2014 to 2–6 years in prison for attempting to sell "valuable masterpieces that belonged to her country". On 13 January 2014, three collections of Imelda Marcos's jewelry: the Malacanang collection, the Roumeliotes collection, and the Hawaii collection; along with paintings of Claude Monet were seized by the Philippine government. In 2015, a rare pink diamond worth $5 million was discovered in her jewelry collection. On 16 February 2016, the government of the Philippines announced that the three collections, valued at about $21 million, were to be auctioned off before the end of Benigno Aquino III's term on 30 June 2016. Marcos influenced fashion in the Philippines, although her role as a patroness of the arts and fashion is still controversial. The second track of Mark Knopfler's 1996 album Golden Heart, is a sardonic song about her. She was the subject of the 2003 documentary film, Imelda. In 2010, British producer Fatboy Slim and musician David Byrne released a concept album about her life called Here Lies Love, which later became a rock musical. In Manila, local performance artist Carlos Celdran performs his Living La Vida Imelda walking tour, which was also performed in Dubai during 2012. 1 2 Mijares 1976, p. 1–10. 1 2 Tully, Shawn (9 January 2014). "My afternoon with Imelda Marcos". Fortune. Retrieved 7 June 2016. ↑ Ellison 1988, p. 1–10. 1 2 Pedrosa, Carmen (1969). Ang Natatagong Buhay ni Imelda Marcos. 1 2 3 4 Pedrosa, Carmen (1987). Rise and Fall of Imelda Marcos. Makati City: Bookmark. 1 2 3 4 5 6 7 8 Pedrosa, Carmen (1986). The Untold Story of Imelda Marcos. 1 2 Polotan, Kerima (1970). Imelda Romualdez Marcos, A Biography Of The First Lady Of The Philippines. ↑ Navarro-Pedrosa, Carmen (1969). The Untold Story of Imelda Marcos. the Philippines: Tandem Pub. Co. p. 118. ↑ Navarro-Pedrosa, Carmen (1969). The Untold Story of Imelda Marcos. the Philippines: Tandem Pub. Co. p. 126. 1 2 3 4 5 6 7 Ellison, Katherine (1976). Imelda: Steel Butterfly of the Philippines. USA: McGraw-Hill Book Company. pp. 35–48. ↑ Ellison 1988, p. 7–10. ↑ Ellison 1988, p. 78–79. ↑ "Beatles to avoid Philippines". Saskatoon Star-Phoenix. Associated Press. 8 July 1966. Retrieved 22 May 2012. ↑ Ellison 1988, p. 107–110. ↑ Philandering dictator added Hollywood star to conquests. The Sun-Herald, 4 July 2004. ↑ Tarling 2000, p. 191. ↑ "Proclamation 1081 and Martial Law". Country Studies: Philippines, United States Department of State. ↑ Pineda, DLS (22 February 2014). "So you think you love Marcos?". The Philippine Star. Retrieved 4 October 2015. ↑ Ellison 1988, p. 134. ↑ Ellison 1988, p. 140. ↑ "Waiting for the other shoe(s) to drop", Philippine Daily Inquirer. 29 March 2016. ↑ Ellison 1988, p. 89–93. ↑ "Ferdinand Marcos, Former Philippines Dictator, Forced Generals To Perform Drag Show, According To WikiLeaks". The Huffington Post. 9 April 2013. ↑ Powers 2012, p. 302. ↑ Ellison 1988, p. 139. ↑ Ellison 1988, p. 280. 1 2 Senauth 2012, p. 137. 1 2 Ellison 1988, p. 119. ↑ Ellison 1988, p. 180. ↑ Masagana 99, Nutribun, and Imelda's 'edifice complex' of hospitals. GMA News. 20 September 2012. ↑ Nutrition and Related Services Provided to the Republic of the Philippines. Virginia Polytechnic Institute and State University. September 1979. ↑ Get to know former First Lady Imelda Marcos on Powerhouse. Power House. GMA Network. 8 July 2013. 1 2 3 4 Senauth 2012, p. 136. ↑ Ellison 1988, p. 16. 1 2 Powers 2012, p. 106. ↑ Ellison 1988, p. 93–97. ↑ Powers 2012, p. 153. ↑ "An insider's guide to Manila: where brutalism meets bamboo", The Guardian. 14 March 2016. ↑ At Philippine Safari Park, Serengeti on South China Sea. Bloomberg Businessweek. 3 December 2013. ↑ "Witness ties Imelda Marcos to Buildings." The Spokesman-Review. 30 January 1986. ↑ "Real Estate Agent Gives Evidence of Marcos Buys. "The Bulletin. 10 April 1986. ↑ "Manila After Marcos: Managing a Frail economy; Marco's Mansion Suggests Luxury". The New York Times. 28 February 1986. ↑ "Bling Ring". The New Yorker. Retrieved 6 March 2016. 1 2 "5 Shopping Sprees So Wild, They Made History". New York Magazine. Retrieved 6 March 2016. ↑ Imelda Marcos TalkAsia Transcript. CNN. 24 January 2007. 1 2 3 4 Pedrosa 2013. ↑ Ellison 1988, p. 58. ↑ "Filipino Women Protest Mrs. Marcos' Extravagance." Telegraph Herald. 28 October 1983. 1 2 3 The Steel Butterfly Still Soars. The New York Times. 6 October 2012. ↑ "Sandiganbayan ruling on Ninoy assassination" (PDF). Philippine Consortium for Investigative Journalism. Retrieved 30 August 2013. ↑ "Creating a Fact-Finding Board with Plenary Powers to Investigate the Tragedy Which Occurred on August 21, 1983". Presidential Decree No. 1886. Malacanang Palace. Retrieved 30 August 2013. 1 2 "Imeldarabilia: A Final Count". Time. 23 February 1987. Retrieved 30 December 2006. ↑ "The day in numbers: $100". CNN. 7 November 2006. ↑ Morrow, Lance (31 March 1986). "Essay: The Shoes of Imelda Marcos". New York Times. ↑ "Marcos' Wife Also Pleads 5th in Probe", Los Angeles Times. 2 October. 1986. ↑ "Imelda Marcos Racketeering Case Goes to Trial". The Christian Science Monitor. 19 March 1990. ↑ Judge Delays Hearing for Marcos, Not Wife. The New York Times. 28 October 1988. ↑ Lubasch, Arnold (22 October 1988). "Marcos and wife, 8 others : Charged by US with fraud". The New York Times. Retrieved 30 August 2013. ↑ Doris Duke Putting Up $5 Million Bail for Her Friend Imelda Marcos, Associated Press (2 November 1988). ↑ Celestine Bohlen, Doris Duke Offers Mrs. Marcos's Bail, New York Times (3 November 1988). ↑ Craig Wolff, The Marcos Verdict; Marcos Is Cleared of All Charges In Racketeering and Fraud Case. The New York Times. 3 July 1990. 1 2 "From the archive, 3 July 1990: Tears and cheers as Imelda cleared". The Guardian. 2 July 2015. Retrieved 11 September 2015. ↑ William C. Rempel & Kristina M. Luz, Imelda Marcos Saved Mother, Hamilton Says, Los Angeles Times (16 May 1990). ↑ Manila Journal;Queen of the Quirky, Imelda Marcos Holds Court. The New York Times. 4 March 1996. 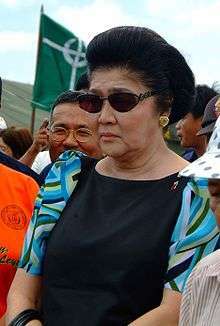 ↑ Imelda Marcos among Newsweek's greediest people. ABS-CBN News. 5 April 2009. ↑ Imelda Marcos Fast Facts. CNN. 10 October 2015. ↑ Imelda Marcos Has an $829 Billion Idea. Bloomberg Businessweek. 24 October 2013. ↑ "Anti-Corruption Campaigner and General Lead in Early Philippine Returns". The New York Times. 13 May 1992. Retrieved 11 September 2015. ↑ Imelda Romualdez Marcos v. Crilo Roy Montejo. Republic of the Philippines: Supreme Court. 18 September 1995. ↑ "Faces of the week." BBC News. 10 November 2006. ↑ Imelda Marcos comes into fashion. BBC. 7 November 2006. ↑ Rowan, Roy (29 March 1979). "Orchid or Iron Butterfly, Imelda Marcos Is a Prime Mover in Manila". People. Retrieved 23 July 2006. ↑ Sandigan OKs Imelda bid for daily hearings on graft cases. GMA News. 21 September 2007. ↑ Imelda Marcos innocent of dollar salting. United Press International. 10 May 2008. ↑ "Imelda Marcos bids for seat as Philippine race begins." BBC News. 26 March 2010. ↑ An audience with the one and only Imelda Marcos. BBC. 27 May 2010. ↑ "INTREVIEW [sic] – Philippines' Marcos fights to get wealth back". Reuters. 13 May 2010. ↑ Imelda Marcos stays as MDG committee chair. ABS-CBN News. 15 September 2010. ↑ Unthinkable: Guess who came to Enrile book launch. Philippine Daily Inquirer. 29 September 2012. ↑ Unthinkable: State lawyers want to know where Marcos funds went Philippine Daily Inquirer. 29 August 2012. ↑ Imelda seeks second term, files COC. ABS-CBN News. 3 October 2012. ↑ Hranjski, Hrvoje; Gomez, Jim (14 May 2013). "Ex-Philippine president wins mayoral race in Manila, Imelda Marcos gets 2nd congressional term". Fox News. Fox News Network, L.L.C. Retrieved 16 February 2016. ↑ "Bongbong Marcos, Imelda and family pray for 'poll integrity'". Philippine Daily Inquirer. 15 May 2016. Retrieved 26 May 2016. ↑ "Imelda, Imee poised for re-election in Ilocos Norte". ABS-CBN News. 9 May 2016. Retrieved 26 May 2016. ↑ "The $10bn question: what happened to the Marcos millions?". The Guardian. 7 May 2016. Retrieved 25 May 2016. ↑ "Imeldific: Aquino gives guided tour of Palace". Philippine Daily Inquirer. 29 May 2016. Retrieved 7 June 2016. ↑ Homage to Imelda's shoes. BBC News. 16 February 2001. ↑ "Global Corruption Report" (PDF). Transparency International. Retrieved 6 August 2009. ↑ "Imelda Marcos's shoe collection gathers mould after years of neglect". The Guardian. 23 September 2012. Retrieved 9 June 2016. ↑ "Imelda Marcos shoe collection survives Typhoon Ketsana". The Guardian. 8 October 2009. Retrieved 9 June 2016. ↑ Manila: 10 Things to Do 7. Marikina Shoe Museum Time magazine. 21 January 2010. ↑ Yolanda destroys Imelda's ancestral house in Leyte. GMA News. 19 November 2013. ↑ "Some Are Smarter Than Others & The Collection of Jane Ryan and William Saunders: Pio Abad's exploration of the Marcos horde", The Philippine Star. 18 September 2014. ↑ Marcos widow claims wealth due to 'Yamashita treasure'. The Bulletin. 3 February 1993. ↑ "On Petition For A Writ Of Certiorari To The United States Court Of Appeals For The Ninth Circuit: Petition For A Writ Of Certiorari." Retrieved 12 June 2016. ↑ Marcoses' Silver Sets Record At Auction. The New York Times. 11 January 1991. ↑ Marcoses' Raphael Sold To Italy for $1.65 Million. The New York Times. 12 January 1991. ↑ Buettner, Russ (20 November 2012). "Imelda Marcos's Ex-Aide Charged in '80s Art Theft". The New York Times. Retrieved 30 August 2013. ↑ Shoes, jewels, and Monets: recovering the ill-gotten wealth of Imelda Marcos. Foreign Policy. 16 January 2014. ↑ "Marcos convicted of graft in Manila". The New York Times. 24 September 1993. Retrieved 30 August 2013. ↑ Gender Policies And Responses Towards Greater Women Empowerment In The Philippines. University of the Philippines. ↑ The Political Economy of Corruption. University of Hawaii. July 1997. ↑ Imelda Marcos Acquitted, Again. The New York Times. 11 March 2008. ↑ Imelda Marcos claims net worth of US$22 million. Taipei Times. 6 May 2012. ↑ Imelda camp mum on Newsweek's 'greediest' tag. GMA News. 6 April 2009. ↑ What happened to the Marcos fortune?. BBC News. 24 January 2013. ↑ "Imelda Marcos's Ex-Aide Charged in '80s Art Theft." The New York Times. 20 November 2012. ↑ Ex-Imelda Marcos aide on trial in NYC for selling Monet work. Philippine Daily Inquirer. 17 October 2013. Retrieved on 17 October 2013. ↑ PCGG: Gov't, not Marcos victims, owns Monet painting Philippine Daily Inquirer. 21 July 2013. Retrieved on 17 October 2013. ↑ Aide to former Philippine First Lady sentenced to prison for trying to sell country's art. New York Daily News. 14 January 2014. ↑ Ex-Imelda Marcos secretary to be sentenced by NY court. GMA News. 6 January 2014. ↑ Marcos jewels could be sold after court rules they were 'ill-gotten'. The Japan Times. 14 January 2014. ↑ Imelda loses jewels in the Marcos crown. The Age. 17 September 2005. ↑ Philippines Seeks Return of Marcos Paintings. Voice of America. 14 January 2014. ↑ "Philippines revalues jewellery seized from Imelda Marcos in 1986". The Guardian. 24 November 2015. Retrieved 17 December 2015. ↑ Plucinska (25 November 2015). "Rare 25-Carat Pink Diamond Discovered in Jewelry Once Owned by Imelda Marcos". Time magazine. Retrieved 17 December 2015. ↑ Perry, Juliet (16 February 2016). "Philippines to sell Imelda Marcos's 'ill-gotten' jewels, worth millions". CNN. Turner Broadcasting System. Retrieved 16 February 2016. ↑ "Philippines to sell jewellery confiscated from Imelda Marcos". The Telegraph. 16 February 2016. Retrieved 27 March 2016. 1 2 Fitzpatrick, Liam (7 March 2005). "Walk the Talk". Time magazine. Time Inc. Retrieved 16 September 2010. ↑ "The Marcos years: 'Golden age' of PH fashion". Philippine Daily Inquirer. 27 September 2015. Retrieved 7 June 2016. ↑ The day I met Imelda Marcos. BBC News. 31 October 2000. ↑ "The Life of Imelda Marcos, in PowerPoint and Plastic." The New York Times. 21 March 2006. 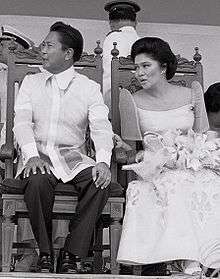 ↑ "Imelda Marcos and the 'terno' of her affections". Philippine Daily Inquirer. Retrieved 19 November 2015. ↑ Golden Heart. Warner Music Group. 26 March 1996. ↑ Review: 'Imelda'. Variety. 17 March 2004. ↑ For a Regal Pariah, Despite It All, the Shoe Is Never on the Other Foot. The New York Times. 9 June 2004. ↑ Director fights for Imelda movie. BBC News. 7 July 2004. ↑ The Imelda Marcos Story — As Told by David Byrne Time magazine. 10 April 2010. ↑ Whaley, Floyd (12 October 2012). "In Manila, 'Livin' La Vida Imelda!'". New York Times. Retrieved 14 October 2012. ↑ "Celdran held, questioned over Imelda Marcos art in Dubai". Philippine Daily Inquirer. 7 April 2012. Retrieved 9 June 2016. ↑ "Censored in Dubai, Carlos Celdran cancels Imelda show". GMA News. 23 March 2012. Retrieved 9 June 2016. ↑ "President's Week in Review: March 1 – March 9, 1976". Official Gazette of the Republic of the Philippines. ↑ "The Order of pro Merito Melitensi". Official Gazette of the Republic of the Philippines. Retrieved 12 June 2016. ↑ Boletín Oficial del Estado. Government of Spain. Ellison, Katherine (April 2005). Imelda: Steel Butterfly of the Philippines. iUniverse. ISBN 978-0-595-34922-7. Retrieved 13 June 2016. Garcia, Myles (31 March 2016). Thirty Years Later . . . Catching Up with the Marcos-Era Crimes. eBookIt.com. ISBN 978-1-4566-2650-1. Retrieved 13 June 2016. Mijares, Primitivo (17 January 2016). The Conjugal Dictatorship of Ferdinand and Imelda Marcos. CreateSpace Independent Publishing Platform. ISBN 978-1-5232-9219-6. Retrieved 13 June 2016. Pedrosa, Carmen Navarro (16 June 2013). The Untold Story of Imelda Marcos. Flipside Publishing Services, Inc. ISBN 978-971-9951-85-8. Retrieved 13 June 2016. Pedrosa, Carmen Navarro (10 May 2013). Imelda Marcos: The Rise and Fall of One of the World’s Most Powerful Women. Flipside Publishing Services, Inc. ISBN 978-971-9951-82-7. Retrieved 13 June 2016. Powers, Phoenix (2012). The Great Gold Swindle: Yamashita's Gold. Lulu.com. ISBN 978-1-105-58311-7. Retrieved 13 June 2016. Senauth, Frank (March 2012). The Making of the Philippines. AuthorHouse. ISBN 978-1-4685-5232-4. Retrieved 13 June 2016. ↑ Daughter of Elpidio Quirino. Assumed title as her father was a widower. 1 2 Corazon Aquino was widowed before her term. Her son, Benigno Aquino III, is unmarried. ↑ Although Rodrigo Duterte has Cielito Avanceña as her common-law wife. There is no designated First Lady. Assassination of Benigno Aquino Jr.